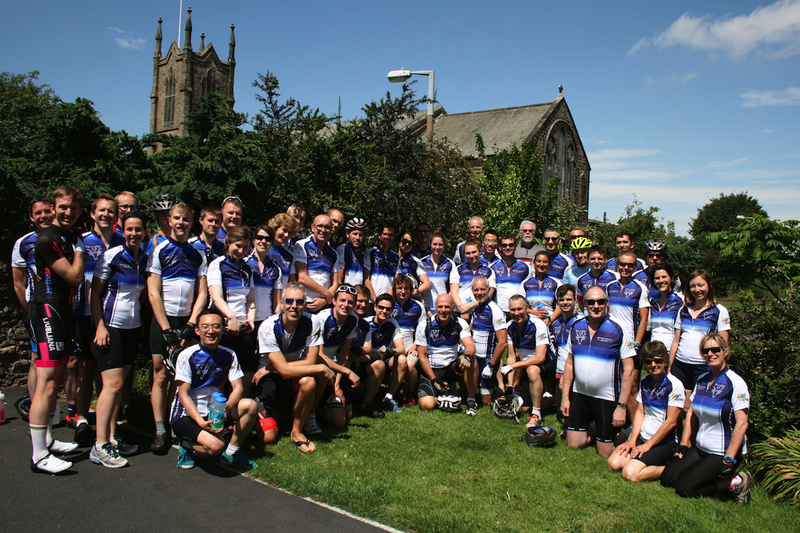 The first time I heard about the Tour de Hertford, a 350 mile cycling fundraiser across the rolling (and sometimes not so rolling) hills of Lancashire and Yorkshire, riding a bicycle was the last thing on my mind. I was just out of hospital after knee surgery and my bandaged leg looked like something I’d swapped with an elephant. As I lay recovering, listening to the student tasked with the job of recruiting volunteers, the wide open spaces of the dales and moors seemed far away indeed. But I knew instantly that the ride was something I wanted to be a part of. Hertford College’s enlightened admissions tutor, Neil Tanner, revolutionised the entry process in the 1960s in an effort to encourage state school pupils to apply to Oxford. All other colleges soon followed Neil’s pioneering example. In 1987, as a nervous grammar school boy from Merseyside, I had benefited both from Neil’s legacy to earn my place at Hertford and the support of an LEA maintenance grant to cover my living costs whilst I was there. And in those days, a tuition fee was something you paid your driving instructor. Fifty years on, however, the funding landscape has changed beyond all recognition. The mountainous financial pressures faced by today’s generation of students, especially those who aren’t fortunate enough to come from affluent backgrounds, makes cycling over a few hills a small challenge in comparison. My time at Hertford was a precious experience and one that I regard as a privilege. Helping to raise money so today’s pupils could follow in the footsteps of my Oxford contemporaries was the least I could do. And so, eight months later, I found myself outside Morecambe War Memorial Hall awaiting the grand depart of the Tour de Hertford, the first leg of a cycling odyssey that would see us dip our wheels in the North Sea less than seventy two hours later. The conditions were perhaps a little too warm but no one was complaining that the weather gods had listened to Morecambe’s most famous son for the journey that lay ahead. “Bring me sunshine”, said Eric, and as we posed for selfies with the great man’s statue, everyone gave thanks that his wish had been granted. With smiles and laughter, we were off! The first couple of hours were a bit of a blur as the group released some of the pent up energy accumulated on the slow coach trip from Oxford. We left the souvenir shops selling saucy postcards, candy floss and kiss-me-quick hats and climbed rapidly away from the seafront. A panoramic view of the dales opened up at the crest of the first big incline, enticing us with its promise, but then we descended into shade and shadows, racing through the narrow lanes, dodging potholes and flying up small crests like boats rising and falling on a green swell of hay meadows. Wild flowers and ferns fringed the hedgerows like bunting, whilst thickets and copses gave us a moment’s relief each time we dipped beneath the surface. Across the channel in France, Le Tour was already in full swing, but this being the Tour de Hertford, our objectives were not quite so competitive. We’d been split into different groups of mixed abilities so instead of one big bunch, several mini pelotons were making their way across the countryside. This made the experience more enjoyable because it ensured no one was under pressure to ride faster than they found comfortable. And certainly, the cameraderie of the road was very strong, with old and new friendships strengthening as the miles rolled past. But having spent a lot of the last twenty years racing as a triathlete or a cyclist to a fairly high amateur standard, I found myself in the fastest group, where I quickly discovered that some of my fellow cyclists had actually been born after I left Hertford. Cursing middle-aged hubris, I got my head down and tried to keep up. I didn’t complain too much, therefore, when I picked up the first puncture of the weekend right on the border of Lancashire and Yorkshire. Since half of my family come from the red rose side, it seemed only natural that the white rose would welcome me with its thorns. A short time later, we arrived in Bentham for our first rest stop of the weekend, where tea and flapjacks and other assorted goodies were already waiting for us. Should I ever return to the Yorkshire Dales for more cycling adventures, I will be able to mark my progress one village hall and teashop at a time. What will be missing, however, is the amazing support from PIE, the event co-ordinator, and the college Development Team. Their efforts meant that the hardships of the ride were always softened by the thought that tea was just beyond the next corner. As the weekend progressed, and fatigue levels rose, the exact time and location of the next respite became vitally important in calibrating the effort needed to get there. An endurance test like a long distance bike ride does curious things to the body. On the one hand, your system craves energy from carbohydrates, but after two days of feasting on gels, cereal bars, fruit and flapjacks, you are thoroughly sick to death of sugar. At one point, I even found myself fantasising about the performance enhancing qualities of broccoli. Maybe this is where Lance went wrong. And so we rode on, every wheel turn and pedal stroke taking us deeper and deeper into the remote places of England. We passed the magnificent arches of the Ribblehead Viaduct, followed the Tour de France as we climbed the spectacular Buttertubs Pass, basked in the courtyard of Castle Howard and held on to our brakes for dear life whilst descending one of Britain’s steepest sections of public road, Rosedale Chimney Bank. Normally, cyclists only dismount when the going gets tough uphill, but Rosedale’s 33% gradient threatens to throw you over your bars going the other way! Later, the windswept emptiness of the North Yorkshire Moors made me think of my days as an English undergraduate reading ‘Wuthering Heights’, which was apt because staying in the student halls at York University meant a few unquiet slumbers for the sleepers trying to block out the noise of a rave somewhere close by. Although we weren’t racing, the image of our group strung out like a team pursuit, hurtling into York at speeds approaching 50 km/h will live long in the memory. And for me, perhaps the most surreal experience of the weekend came shortly afterwards as we entered the city centre. A race meeting had finished and the racegoers streaming away from the course were thronging the streets in crowds hundreds deep, so we had to weave our way through like riders approaching one of the mountain top finishes of the Tour de France! I am certain I heard someone call “Allez! Allez!” in a broad Yorkshire accent. Clearly the Tour of France left its mark on these parts when it visited in 2014. I hoped we that too would leave our mark with the funds we hoped to raise. Each night we convened for an after dinner motivational speech from our very own maillot jeune, the Principal, Will Hutton who, should he ever wish to make a career change from economics, would have a great chance of success as a standup comedian. Will entertained us with his observations on each day’s ride before handing out special jerseys to that day’s King and Queen of the Road, the rider or riders (we had a tandem!) who had been the most cheerful, or friendly, or doggedly determined (or all three!) during that day’s stage. Needless to say, there were always many contenders. The third day was a personal challenge because I was suffering from an upset stomach and it felt like I was peddling squares for most of the day. I am very grateful to Barrie, Sam, Dan, Matt and Jon for waiting at the top of each climb for me to appear, a speck in the distance, like some bicyling Omar Sharif. But as the shadows lengthened on Sunday evening, all the groups were able to reconvene at a pub for one last refreshment before we freewheeled down the final hill to the wonderfully named Boggle Hole Cove. I felt quite emotional as I dipped my bike wheel into the North Sea, partly through relief at having survived the rigours of the weekend and partly through sadness that we had reached the end of the journey. According to Matt’s cycling computer, the journey had taken us 68,000 pedal strokes. So with fifty riders (including one tandem! ), that makes about three and a half million revolutions, an cumulative total of 16,750 kilometres (assuming 335km average per rider) and a grand total of £118,000 for the college’s student support. More technical folk may like to call this ‘big data’ but I prefer to let Eric have the last word. I think I can safely say that the Tour of Hertford was a resounding success on all counts. Well done to all my riders and fundraisers! I would definitely like to #followmyhert in 2016!